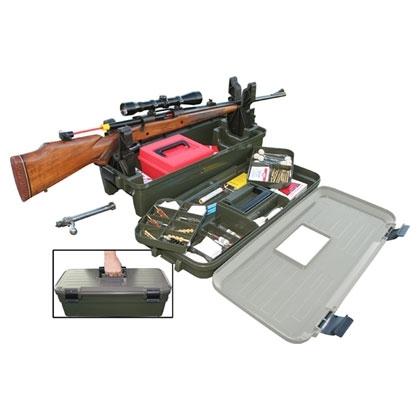 Sporting a gun cleaning kit on top with a rifle maintenance cleaning stand base. It utilizes a two-piece design for compact transport and convenience. This setup is a must have for breaking in a new barrel, testing loads and sighting in rifles. Every one knows, how you run the first box of ammo though your new barrel, will effect it's group sizes the rest of it's life. That is why competition brenchrest shooters clean their barrels on average every 6 or 7 shots. 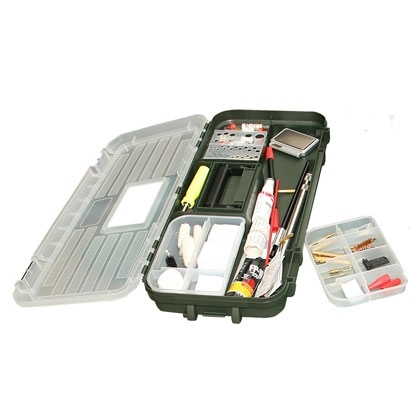 The gun cleaning kit top section offers loads of divided space for jags, brushes, solvents…etc, keeping items sorted and organized. The two trays can be positioned four ways. By positioning the left tray forward for example, you can create a protected space for your shooting glasses if you wish. 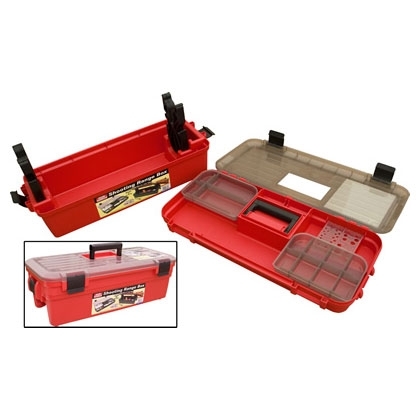 The long section in the front is for break down cleaning rods, bore guides, tico tools, chamber or choke tube brushes, the large aerosol cleaning spray cans, etc.. With it 18 compartments and bore brush guide the Shooting Range Box has more features than any range bag made. 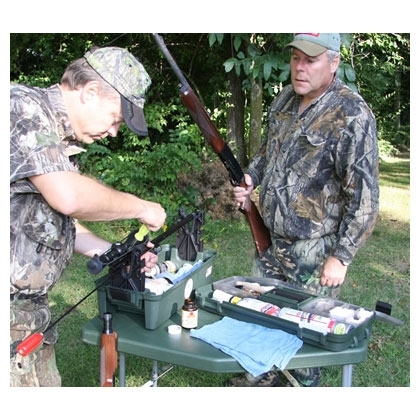 The base or "rifle shotgun cleaning stand" offers plenty of deep storage for supplies and ammo. 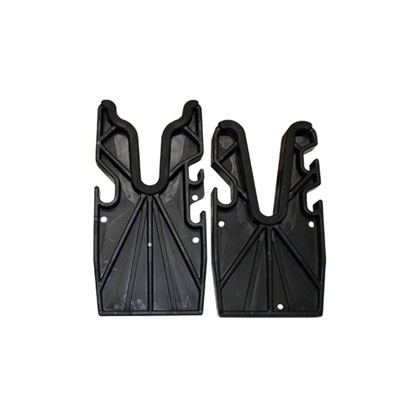 A pair of adjustable gun forks featuring soft, over-molded rubber padding offers easy positioning of firearms with a firm, non-marring hold. The overall length of the Shooting Range Box provides excellent stability for nearly any size firearm. The bottom base is big enough to hold our largest ammo box the R-100, and most bottles of cleaning solvents will sit up right, without leaks. Made with chemical resistant polypropylene. Size 25"x 11.5"x 8.75" high. We suggest you read your gun cleaning instructions that came with firearm and maintenance it with the tips they suggest. bit on the pricey side, but very happy with the product its self. very well made, good space for all items in the bottom , and loads of little sections on top.&nbsp;very happy. This is an excellent product for all sorts of shooting accessories. The top section is very well laid out with space for all sorts of kit from cleaning rods to jags, patches and mops. The bottom section is quite large and can accommodate cleaning kits, oil cans and ammo. 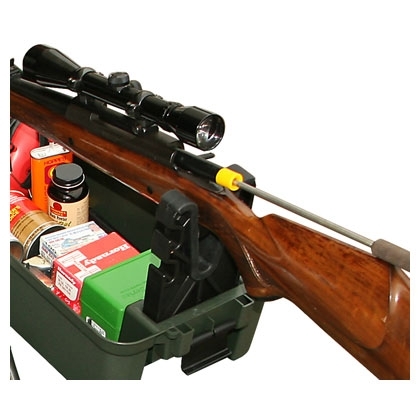 The rifle stand is a great feature and it is extremely useful for maintenance and sighting in. Great build quality makes a nice sturdy case. Very happy with my purchase and as always the great service from Uttings.